Before the first true foldable smartphones make their market debut next year, some companies are still flirting with the idea of dual-screen phones. ZTE's dual-screen Axon M missed the opportunity of becoming a market success, even though it was the first of its kind. The ZTE Axon M with two displays sounds like a good idea on paper, but the execution leaves to be desired. Microsoft, however, tackled the dual-screen theme completely differently, although we're not sure that it's going to see the light of day. 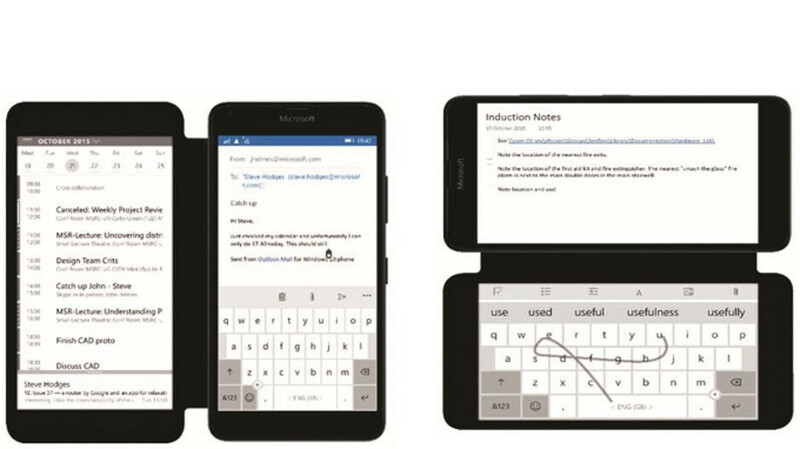 Spotted recently on Twitter, Microsoft Research's Lumia 640 prototype smartphone features a secondary display in the form of an e-ink cover. The concept smartphone Display Cover is meant to “improve productivity and convenience” and offer consumers a practical solution at the same time. The secondary display, which is, in fact, a display cover, doesn't feature full-touch functionality. Instead, Microsoft added five touch buttons at the bottom, which connect to the interface circuitry found on the rear of the smartphone via cables that run through the flip cover hinge. Microsoft's Display Cover is made of a bezel of soft-touch fabric that's heat-bonded to the display and to the back of Alcantara using custom-made heated tolling, the company claims. That's OK, Phone Arena also likes to say the Moto Atrix 4G was the first phone with a fingerprint scanner even though the Moto ES400 WinMo phone was released almost a year earlier. I was going to say that, some places have short attention spans, and can't bother to do a little search to make sure. Oh by the way, they're is a phone that was made a while back that had both a touch panel and a e-ink screen on the back called the yota phone. Also the successor, Yotaphone 2.